I love the non-traditional colors you've used! Love the cards, love the cards! Enjoying so looking at all of the creative works!!! Nice cards. The color choices are stunning. Joan! Your cards are wonderful...you're sooooo clever! That first one...super creative. Your second card?! Oh my, how CUTE!!!!!!!!!! Cute cards. Love the purple. You have an inspirational talent. Thanks for sharing! Great cards. Love the design of your first card...need to look at my stamps a different way, thank you for the inspiration. There are so many great products in this catalog. I'm enjoying the hop and the many projects from everyone. Love how you used one element from one stamp set to make a fabulous card. Thanks! Love how you showcased that crystal origami stamp... I would never have envisioned using it the way you did... beautiful! Wonderful cards. I love that crystal. Thanks for sharing. The first card is stunning. Clean, simple and so elegant. I just adore the second card. The non-traditional colors are just fun. Love the cards. Great non-traditional colors. I love purple and the stain glass snowflake is beautiful. Fantastic cards Joan. Love your colour choices! 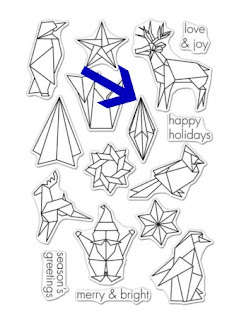 Love the origami Christmas symbols. The colors you used were beautiful! Great release! I always love your super creative and modern designs, Joan! These are both so beautiful and whimsical! I absolutely love them both! Just too cute! These are so fun! Thanks for sharing! Beautiful colors and design on the first one and cute idea to make a shiny reindeer. Thanks for sharing your nontraditional take on these cards. Cool sets! Cute cards! Love the way you've used these stamps in such intriguing ways! It is great to see your fresh take on these holiday cards. I love the origami stamps! Good use of the origami stamp to create something so unique. Great cards. Really like the origami star design & colors. Thank you for sharing your ideas and being part of the new winter release blog hop giveaway. I wasn't very fond of the origami images until I saw your card! All of a sudden a bright light appeared and I was wowed! LOVE how you did the star from the gems and the colors ROCK!!!! Absolutely breathtaking! TFS! Beautiful blending of the Tombows on your first card, and the second is so cute and fun. Both are your signature simplicity with tons of style. Love, love, love that crystal in aqua and purple. So clever and it really catches the eye. I her green reindeer are "in" this year so this is perfect! That should be I hear green reindeer. My gosh, the crystals are fabulous. I love the colors. Love how your cards turned out with the new products! Cute cards, love the little reindeer. Thanks for sharing. Love the pinks and purples! Really pretty, Joan. I love the colors and the cute deer. Love all the cards! I can't wait until the holidays! Your crystals are amazing, that design would work for any time of year. What fun cards! Love the use of the colors. Awesome cards -- the first is so gorgeous with those colors, and your second is just so sweet and shiny! What fun cards! I love how you used the origami set! You are a very entertaining blogger. Yes....our dear can be anything we want them to be! Just for that I give you A+! Such great cards and I love how you chose such unique colors for both of them! Very cool! What a cool way to use the origami set! I love it!!! Love the origami set....so unusual and your cards are beautiful. What a brilliant way to use the crystal stamp! Love the shiny green deer too. So cute!!! I love the pink polka dots!!! Wow the first card is really stunning! Gorgeous cards! What a beautiful way to use the crystals! So cute and love the colors. Thanks for sharing. Very clever and creative! Thanks! Two very creative cards with that origami set! Especially love your colorful snowflake!! These origami stamps are wonderful..
Love the idea of a prism and icicle rolled into one. The little deer would be perfect for a child's birthday card(one whose bd is in december). I'm full of ideas now! Love the shiny green reindeer!! I love your shiny green reindeer!!! 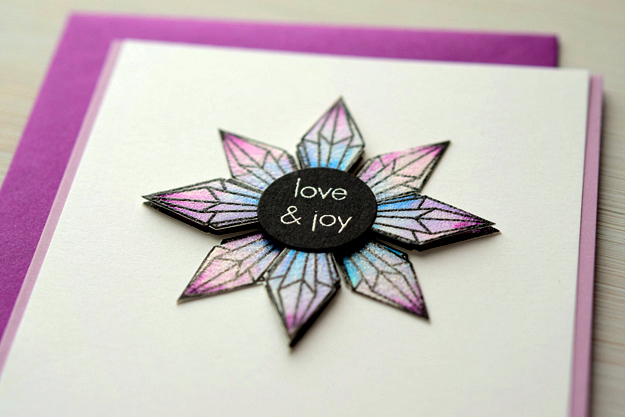 :) Beautiful colors in your crystal origami card! Winter Release is fantastic! the crystal card is inspired! Love it! PURPLE . . . what a great color for Christmas! I love these colors! And the polka dots! Love your non-traditional colors on both cards...plus the way you've used that prism on your first card. Love both of these - very hip! Thanks. Amazing cards, Joan!! I love the faceted star you created - reminds me of Swarovski crystals. And your green foil reindeer is just the cutest thing ever!! Fabulous modern holiday cards! Your choice of non-traditional colours is so fun. The foil deer is great! I really like your color choices on the first card; very nice. On my gosh !! Your 1st card is stunning. I love the colors and design. Polk a dots are always my favorite, and that is such a fun card to make. Great job. Cute cards & designs. Love how you made your own flower. Cool use of the stamps!! Love how you used that diamondey gem stamp to create a medallion! And yes, you are allowed to mail that reindeer whatever you want it to be! Love, love the crystal card, so cleaver of you! The colors are beautiful! Your crystal / star card is very clever, really great ! Cute cards! Cool way to use the "crystal" shape! What great unique cards. Love the purple. Super cool cards, so modern! You are so very creative! TFS! Great idea with the crystals! Great cards with fantastic color combos! I will admit that the origami stamps did not capture my interest. But they are really growing on me. What wonderful cards! The origami set looks fantastic! Looks like it'd be cute with some of my gem-inspired stamps from other brands!! Very unique take and style! Interesting and Unique way of using one image to create another stunning image and non-traditional colors! Great job. Well done! Love your crystal cards absolutely lovely, and that precious is an awwww. Thank you for sharing your talant with us. Awesome new products and projects! Beautiful cards, love the less traditional look! The colors on the crystals is beautiful. Like the dimentional layering. Ah, green foil. Lovely and bright. Glad you did a card with the origami set. The origami card is so wonderful! Love how you used the origami bauble in multiples to make a delightful card front. Great cards ... love the new release. Cute products and I love what you did! Love your clever use of the origami gem! Beautiful cards! Especially love the first one. Very clever use of the pretty stamp! Love your idea using the origami stamp. I love how you turned the crystal into a snowflake with the repeated stamping. Great job. Super creative you!! Love the colors and how you used the origami image to create the first card!! Just to reiterate. . .love those colors!! Beautiful cards. Love the dimension and repurpose of a stamp on your first card. Love the cards & also the idea of turning the kitchen into craft room! So funny - made my day! wow, that origami crystal is amazing! Love that first card, Joan. Very clever use of the stamp! WOW... Love your creativity creating that snowflake out of origami stamp. LOVE all your cards! Very clever, love your cards! Great, fun cards. Thanks for sharing. I love how clean your cards look! Such pretty cards - the origami one is very creative on your part - just love the colors you've used!! It is so clear in your creations that you are a bundle of fun. LOVE the jewel one you made - thanks so much for sharing! Such a fresh approach. Love the shiny green deer with the pink bubbles. Way to think outside the box on these new stamp sets! Love the colors that you used on the first card too! Such non-traditional colors that would pop out of a mantle with traditional colors - I love it! Lovely unique cards. Love the green deer! Great cards! Thanks so much for sharing them on the blog hop. Wow!! Great use of that stamp!! Love it!! Love how you used that stamp in the first card. You are an Original!! So creative...who would have thought of green foil deer! On polka dots, no less! Love it. Love the colors you used on the crystal! Too cute!! Love your colors. TFS!! Love your out of the box colors for the Christmas card. Thanks for the inspiration. Unusual colors which you use beautifully! Great colors great cardS! TFS! Very modern cards and I love the colors. 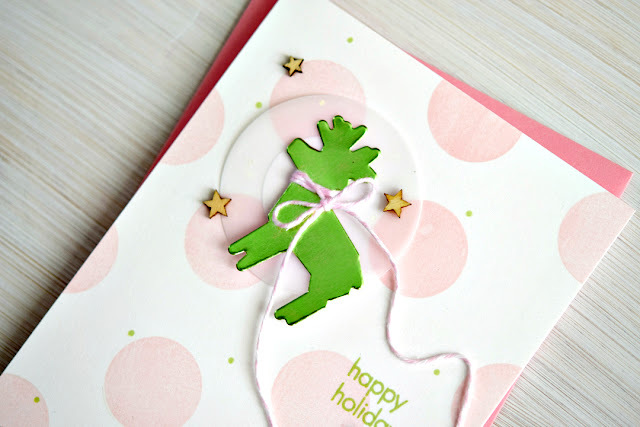 The green reindeer card is simple but so striking. And different!! Love it. Oh my, the origami looks like stain glass. Gorgeous! TFS! That Origami set is so versatile! I love what you've done with that stamp! So wonderful! Beautiful card and your little deer is so Cute! Wow, your cards are so colorful and creative. I love the origami set! These cards are adorable! I love that pop of GREEN! Cute! Beautiful cards... love your layout designs, color combos and great dimensional effects! TFS. I love the modern style you gave to your holidays cards ! So fresh and so new ! It is great to see how different kind of cards we can make with the same stamp set. Thanks so much for sharing and for the chance to win. Oohhhh! How fun are these cards! I love this set! The origami stamp set is fun. I like how you used them and I also loved your green foil deer. You are right...foil, polka dots...you can do whatever your heart desires! Unique takes on Christmas! Thanks for sharing! the little deer is darling. Love the way you used the origami stamp set. Great cards. Wow your first card blew me away with its' stunning beauty! Love the fun, non-traditional colors! Such pretty cards! Thanks for the inspiration. Loving your unique color scheme and modern designs. Your first card is just stunning. The second one is just so fun! Very pretty! Love the blue and purple! Sweet cards. Love the pale pink polka dots! I like the way you used the crystal. Very interesting and different colors on the second card. So pretty! Love those crystals! I love how you stamped the crystals until you made a star shape. Your painting looks iridescent. Such gorgeous cards. 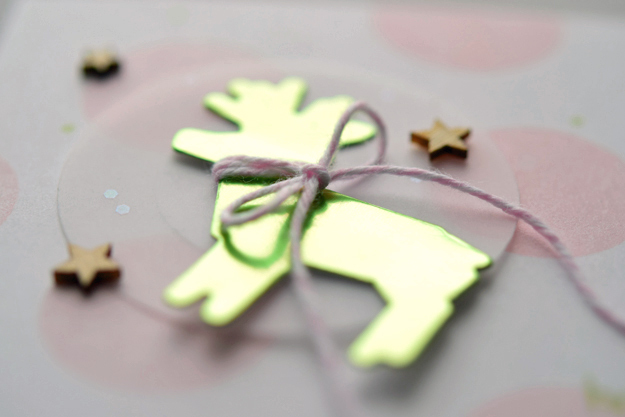 Love that foil reindeer. Thanks for sharing! Thanks, Joan, for sharing your striking cards with us and for participating in this great hop and giveaway! Wow! They are both so beautiful and unusual. The repeated stamping and colors in the first card are awesome!